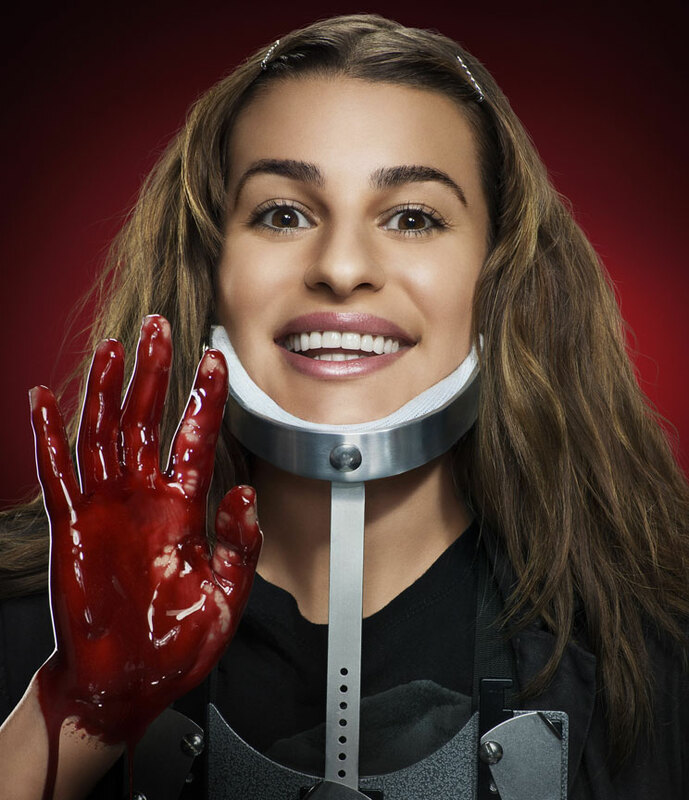 Although Scream Queens was a gleefully ridiculous (and gory) comedy, there was also a “whodunnit” mystery running through the first season, so the whole thing could’ve easily derailed or fizzled out in the final expository episodes… but I’m happy to report that I for one enjoyed every last second of it. In retrospect, I really should have guessed the identity of the third “Red Devil” killer before it was explicitly revealed… I even noted back in my first post how strange it was that Lea Michele was playing such a minor supporting role, but naively accepted the actress’s cover-story about simply taking the job for the associated “esprit de corps”! They also did a very good job of casting similar-looking actors to play the twins and their estranged father… which, again, should have tipped me off, but I’m not always the brightest bulb in the box. Regardless, I really enjoyed Michele’s unhinged performance in the flashbacks/forwards, as “Hesta” proudly revealed how-she-dunnit (and got away with it)… that creepy/crazy smile she gave the camera as the exposition unfurled was a true work of art! 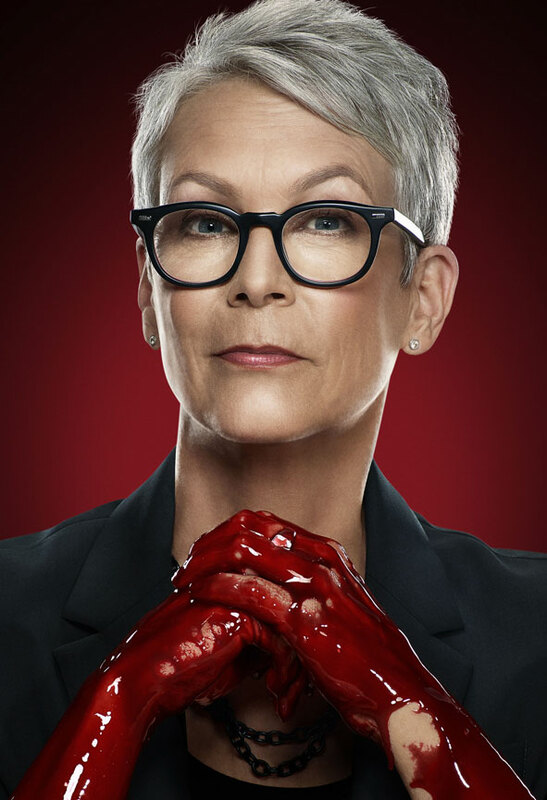 As for my other faves… I was glad to see ‘Dean Cathy Munsch’ (Jamie Lee Curtis) kick some serious arse, and seduce numerous besotted conquests, including a fellow faculty member and a studly student! I also grew very fond of ‘Sadie Swenson’ (aka “Chanel #3”) played by Billie Lourd, who rocked a pair of ear-muffs throughout the season, as a sly nod to her real-life mother, Star Wars legend Carrie Fisher… though in the final episode prison protocol forced Sadie to ditch the muffs and style her hair into a full-on Princess Leia “cinnamon bun” do (for fear of having her ears cut off, according to the official in-series explanation). Meanwhile, Lourd has been cast in the upcoming Star Wars sequel, and had an inspiring observation to make about her mother’s iconic character, in a recent interview with People magazine (via the EW site): “When I saw the [original] movie for the first time, I noticed my mom was not only equally as confident and strong as the men, she was one of the most confident characters in the entire film… It made me realize women are just as powerful as men and that we can truly do anything they can – if not more!” Right on! This show seemingly marks Lourd’s acting debut, but she really made a strong impression here… despite the fact she was playing such an enervated and (supposedly) emotionless character, she proved to be a fantastic physical comedian, and always found an eye-catching way to stand or move through a scene, while consistently delivering the most entertaining/amusing reaction shots. A head-tilt from her was worth a thousand words! And Sadie looked so cheery after she’d been convicted and committed to an insane asylum… I assume that was probably a side-effect of whatever medication she was on, but I couldn’t help feeling happy for her, in an odd sort of way. Apparently the ratings were pretty low for this series, especially towards the end of the season, and there’s still some doubt over whether it will be renewed… but for what it’s worth, I thought it was a lot of fun, and I was eagerly searching online for the DVD boxset as soon as the end credits rolled! [Note: The boxset doesn’t actually exist yet… but I’ll definitely be adding it to my “to buy” list for next year]. This entry was posted in Rants about Films, Rants about TV and tagged Billie Lourd, Cathy Munsch, Chanel #3, Chanel #6, Dean Munsch, Hester Ulrich, Lea Michele, Princess Leia, Sadie Swenson, Scream Queens. Bookmark the permalink.